During its short known existence, lysergic acid diethylamide (LSD) has created quite a name for itself—profound for some and obscene for others. The popularity and infamy of LSD is a rather mixed bag. It’s been used for everything from lab experiments to party drugs. LSD has also been tested on subjects in a wide range of applications—from a medication to aid in the quest for mental health to a powerful weapon of war. Still, there is much to learn about this wonder drug. On his deathbed from cancer, Aldous Huxley, the author of Brave New World, instructed his wife to bring a syringe filled with liquid LSD so that he could go on the world’s craziest trip. She gave him a 100-microgram shot of LSD and repeated that dosage one hour later. He died on what is probably the biggest dose of the powerful hallucinogen that the world has ever known. But what was it like? What can science and studies of the brain tell us about how LSD makes us feel and how it alters our perception and experience? For those of you curious about these sorts of questions, here is a list of 10 things that LSD does to the human brain. For anyone who’s taken LSD, it shouldn’t come as too much of a surprise that the drug activates many of the otherwise inactive parts of your brain. In fact, it’s quite astonishing that the dormant areas of the brain light up like a candle on fMRI machines when a person on LSD gets a scan. For the brain, the LSD experience is like a symphony of neurons firing. Science has shown that LSD awakens even the parts of the brain which are usually dark, hibernating in the deepest of slumbers. Another unexpected discovery is that this activation of parts of the brain that are normally sleeping isn’t modest or negligible. As shown in the image above, almost all of the brain is activated, using all of its neurons and potential at the same time. Without a doubt, scans have shown that LSD affects the entire brain at once, creating a cacophony out of ordinary experience. What parts of the brain does LSD actually affect? All of them! LSD strongly affects the neurotransmitter serotonin, which is also impacted when people take other drugs such as MDMA (aka Ecstasy). Although MDMA, like LSD, works on several neurotransmitters, its most popular and pronounced effect is the classic “euphoria” feeling caused by flooding the brain with serotonin. As a regulatory neurotransmitter, serotonin keeps your body’s systems in balance so that you feel “normal” and stable. Serotonin regulates the body’s mood, temperature, hunger, sleep patterns, and much more. That’s why messing with these drugs can sometimes get people into trouble. When their bodies receive too much serotonin, they can’t regulate these important functions. Ingesting hallucinogenic drugs can cause users to see images, hear sounds, and feel sensations that seem real but do not exist. Their effects typically begin within 20 to 90 minutes of ingestion and can last as long as 12 hours. Experiences are often unpredictable and may vary with the amount ingested and the user’s personality, mood, expectations, and surroundings. On some trips, users experience sensations that are enjoyable and mentally stimulating and that produce a sense of heightened understanding. Bad trips, however, include terrifying thoughts and nightmarish feelings of anxiety and despair that include fears of losing control, insanity, or death. To some, this sounds like an absolutely awful experience that no one would want. But others will pay good money for it. A user’s mood and overall mental state going into the psychedelic LSD experience plays a pivotal role in the outcome of that episode. The trip appears to be in the eye of the beholder in more ways than one. Although LSD is known to have a particularly strong effect on the serotonin receptors, namely the 5-Ht2A receptor, it’s not clear exactly how LSD produces hallucinations. One belief is that the drug causes receptors to fire at random and misfire, resulting in a sort of total brain “static” or “noise” on the otherwise calm backdrop of normal neural functioning. This static noise is said to lead to profound alterations of consciousness. Although we’re not going to say that LSD is harmless, it is considerably safer than drugs like alcohol or opiates according to DrugAbuse.com and some other sources. In addition, overdoses are rare. Have you ever met someone who overdosed on LSD? Probably not. In fact, there is some recent evidence (confirming old information) that LSD may be useful in the treatment of alcoholism. AA founding member Bill Wilson mentioned that he tried LSD as a cure for alcoholism with moderate success. However, the effects wore off and he ended up drinking again. The use of LSD requires a definite commitment to these altered brain states. Most studies and observations claim that the LSD “trip” typically lasts 8–12 hours (usually 12). That’s half a day for one dose. Needless to say, LSD users had better be prepared for their brains to be completely changed and uninhibited for quite a long time. VeryWellMind.com notes that LSD impacts your body and mind for at least 12 hours after you take it. As the drug is made and sold illegally, you can’t be sure how pure it is or what dosage you’re taking. Those factors influence your “trip” and how long the drug stays in your system. Many users report feeling a loss of the “self,” which is the lack of differentiation between the self and the world or the environment. They often report being one with each other, with nature, or with some other object that obviously isn’t the self. There may be a neurological reason for this. In 2012, researchers undertook the first study in the UK to actually administer LSD to patients. (It had been illegal to do so for the previous 40 years.) Of course, the study showed that LSD activates the brain. But the researchers also found that the “seat of consciousness” in the brain (the part that’s called our “default mode”) receives less blood under the influence of LSD. The default mode network is the “resting” portion of the brain, which is most active when the brain is at rest. This part of the brain is mainly made up of the medial prefrontal cortex, the medial temporal lobe, and the posterior cingulate cortex. These regions largely control things like daydreaming and imagination, which explains why LSD affects the proper functioning of the pictorial imagination and users experience visual hallucinations. As the retrosplenial cortex and the parahippocampus in the default mode network become more disconnected from one another, LSD users experience greater “ego loss.” Together, these regions of the brain appear to produce the typical “sense of self” that we experience when we’re awake. In addition, brain networks that are usually segregated begin to communicate with each other in a major way when influenced by LSD. In a very real way, LSD creates a temporary psychosis in the brain, albeit a mild and some would say an enjoyable one. This isn’t surprising because the default mode network also plays a role in diseases such as Alzheimer’s, depression, post-traumatic stress disorder, autism, schizophrenia, and bipolar depression. Changes in this region of the brain are correlated with these types of mental illnesses. Since the 1960s, when research into LSD was banned, there have been widespread fears about permanent psychosis occurring after an LSD experience. However, research in the 21st century showed that these concerns were entirely unfounded. Although it is groundbreaking and brand-new, some evidence shows that LSD helps a variety of mental illnesses, including anxiety, depression, post-traumatic stress disorder, and bipolar depression. However, these results seem to be paradoxical. On the one hand, LSD sends the brain into an acute, temporary state of psychosis by altering its natural resting state on a base level. On the other hand, the drug seems to alleviate psychoses and other mental illnesses for at least several months after consumption. This is like an odd chemical version of electroshock therapy. LSD shows particularly strong promise in the treatment of depression. Doctors and researchers are hopeful that the drug will help those diagnosed with terminal cancer to treat their ongoing battles with depression. With its long-term effects on serotonin receptors, LSD seems to act like many of our modern-day antidepressants, particularly SSRIs which enhance the functioning of serotonin receptors. Any enhancement of the serotonin 2A receptor (5-HT2AR) may prove to have similar effects to drugs like Prozac. Time will tell as more studies are performed. In one of the first studies on LSD, researchers from Harvard University conducted an experiment with the drug in a chapel basement on Good Friday 1962. They gave 10 divinity students LSD to see if it would create a mystical or even religious experience. The results were considered a success as the participants did share a religious experience. This was the start of what would become a massive movement in the United States to study LSD at colleges. Then the government stepped in and banned LSD research on humans. Studies have shown that the left hemisphere of the brain controls and dictates our sense of self. The right hemisphere has something to do with a sense of “presence.” This has been evidenced by the God Helmet, a helmet with electrodes which stimulates a sense of presence, often divine, when put on regular people. Our results suggest that this effect underlies the profound altered state of consciousness that people often describe during an LSD experience. It is also related to what people sometimes call “ego-dissolution,” which means the normal sense of self is broken down and replaced by a sense of reconnection with themselves, others, and the natural world. This experience is sometimes framed in a religious or spiritual way—and seems to be associated with improvements in well-being after the drug’s effects have subsided. Modern research may someday link the God Helmet and the LSD user experience. It’s possible that LSD stimulates right-hemispheric activity while sedating the left hemisphere (loss of the sense of self and ego) to create what users have reported as the religious LSD experience. 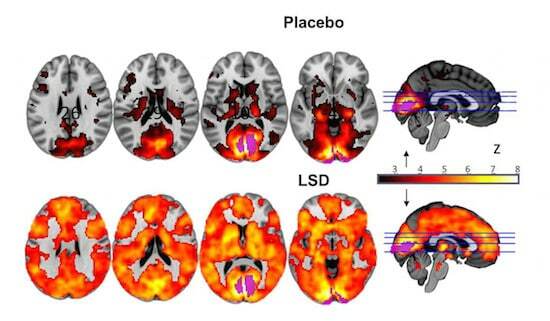 Brain scans also show that LSD affects the temporal lobe most of all. The temporal lobe is responsible for memory and is aggressively stimulated when wearers experience the mild-altering changes of the God Helmet. The brain is a curious organ, and there is much to be learned. In time, our society may realize that many illegal substances may provide a deeper understanding into the workings of the human mind, the last great frontier. I like to write about dark stuff, horror, philosophy, and history. This article will be shared on Beautifully Disturbed, my Facebook page with several thousand followers, as well as in Acid Math groups and other such applicable places where the audiences will read and enjoy it. Read more insane facts about LSD on 10 Secrets Of LSD That Will Blow Your Mind and 10 Insane Ways The CIA Drugged People With LSD.